"Lo, children are an heritage of the LORD: and the fruit of the womb is his reward. As arrows are in the hand of a mighty man; so are children of the youth. Happy is the man that hath his quiver full of them: they shall not be ashamed, but they shall speak with the enemies in the gate." When I came across Frans Hofmeester's time-lapse video of his little girl, I couldn't help but smile, laugh and cry because I have 6 daughters (yes, six!) of my own. Each one is growing up too fast for my liking. Each one grows into a beautiful young lady. And when I read the above quoted Scripture, I can't help but praise God for making me the richest man in the world because He has blessed me with six (yes, six!) beautiful daughters. To God be the glory! Dear Reader, do not think for one moment and be fooled that Mr. Hofmeester's little girl's development began at birth. 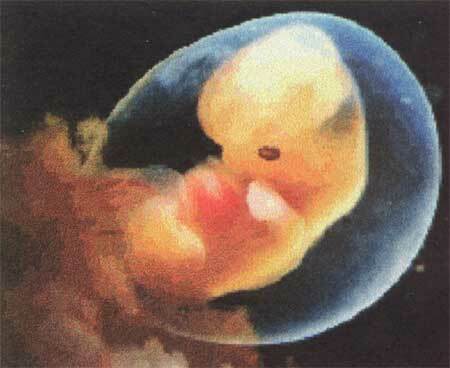 This child began developing in utero. In fact, Psalm 139:14-16 declares, "I will praise thee; for I am fearfully and wonderfully made: marvellous are thy works; and that my soul knoweth right well. My substance was not hid from thee, when I was made in secret, and curiously wrought in the lowest parts of the earth. Thine eyes did see my substance, yet being unperfect; and in thy book all my members were written, which in continuance were fashioned, when as yet there was none of them." Only God knows you best because He made you. Don't think for one second that your existence here on earth was by chance or luck. Only fools gamble. Secondly, don't believe that your existence on earth at this particular moment is coincidental. You were born according to His plan, not your parents'. I want you to know something else, friend. You might not know this. Perhaps you do. But, I'm going to challenge you today to make a decision to either believe man or to believe & trust in God. Open your Bible and read this passage for yourself and tell me who you will place your trust in. Reader, what does God say in this passage? He says that you (and not just you personally, but all men) do not know how the Spirit works or how bones grow. God states quite plainly that you don't know God's works. How are bones separated from the other flesh? How do they grow out of them and hardened? How do the hundreds of cells know which way to migrate within the egg and develop into eyes, ears hands and feet, heart and brain? How do the more solid and substantial parts of the baby's body strengthen while other parts seed are converted into skin and flesh; sinew and marrow? To put it bluntly and succinctly, only God knows. I'm sure there is plenty of scientific research that shows the embryo's development and many theories as to human development. Somehow, though, science is at its best when it describes God's creations, whether it be geological entities, the discovery of new universes or the observation of a micro-cellular event such as in utero development. Science is at its worst when it prescribes the reason why things are the way they are. Thus, God's work agrees with His word. We can't say that about men. The framers of the Declaration thought this as well, which is why they declared that Government secures these God-given rights and does not bestow them. And as it pertains to unborn children, their rights and the right to due process are denied when laws are enacted to murder them without due process. So, who are you going to trust? You can't have it both ways. God will not share His glory with any man. Children are a precious resource that is God sent and God given. Let's all work hard to protect the rights of every living being, born and yet-to-be born. I'm Tired of Men's Lies. Today I Choose to Trust Jesus!